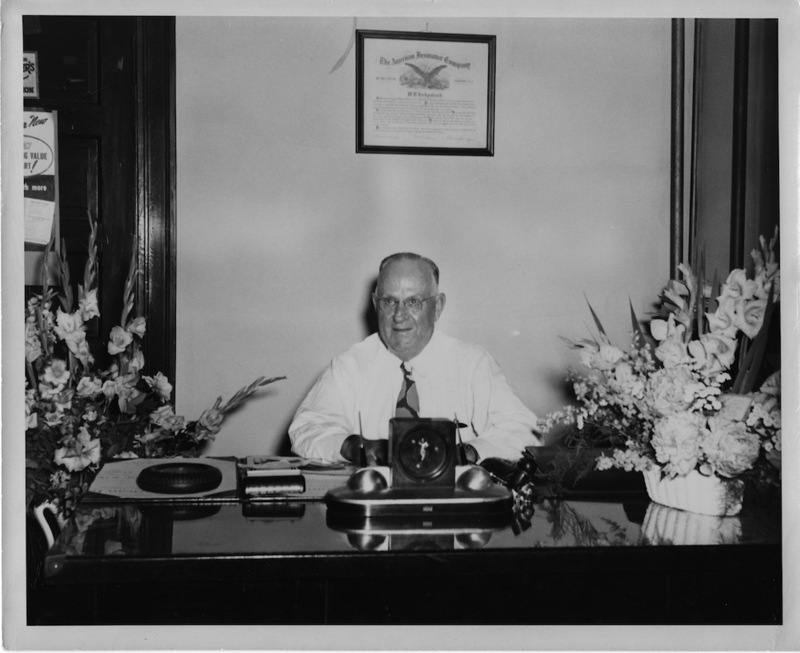 Kirkpatrick, Jones & Herzog Insurance Agency, Inc. got its start on July 7, 1897, when William Kirkpatrick starting selling insurance for what was then the Rockford Insurance Company. Kirkpatrick's family had a farm near Sciota, IL, where he was born on February 28, 1877, to a family of eight boys and three girls. He married Miss Ella L. Hart on December 26, 1900. He moved to Elgin in 1913 and started a partnership with D.A. Chamberlin. Chamberlin retired in 1916 and Kirkpatrick conducted business alone until he was joined by his daughter E. Glendeane and son J. Harter. Kirkpatrick was in the insurance business in Elgin for over 50 years until his death in 1964. Kirkpatrick's family described him as a devoted husband and a loyal and loving father. He was also known as warmhearted social man with a great sense of humor who loved people and recognized the real worth in each individual. He was a community leader and man of deeds. Kirkpatrick's membership in the Izaak Walton League is matched by current proprietor Bill Jones. As president of the Elgin Area Council of the Boy Scouts, Kirkpatrick supported the purchase of Camp Big Timber. Current proprietor Jay Herzog is a enthusiastic and involved member of Three Fires Council. Kirkpatrick served for many years on the board of trustees of the First Congregational Church of Elgin. Kirkpatrick was president of the Elgin Rotary Club from 1926 to 1927. He was a member of the Order of the Eastern Star, Elgin Lodge of the Elks, and the Men's Garden Club. The Downtown Neighborhood Association did not exist during his lifetime, but if it had, Kirkpatrick most likely would have been a board member, like current proprietor Karin Jones. Thanks to the Elgin Area Historical Society and William's granddaughter Sarah Hudgens for the source material.